If you found this map interesting, you’ll definitely want to check out our similar post the Best Selling Singer Or Band From Each London Borough – it’s incredible how many of the world’s top acts have been associated with London. The nation’s capital, Washington, DC, which isn’t in a state, gets ignored again. 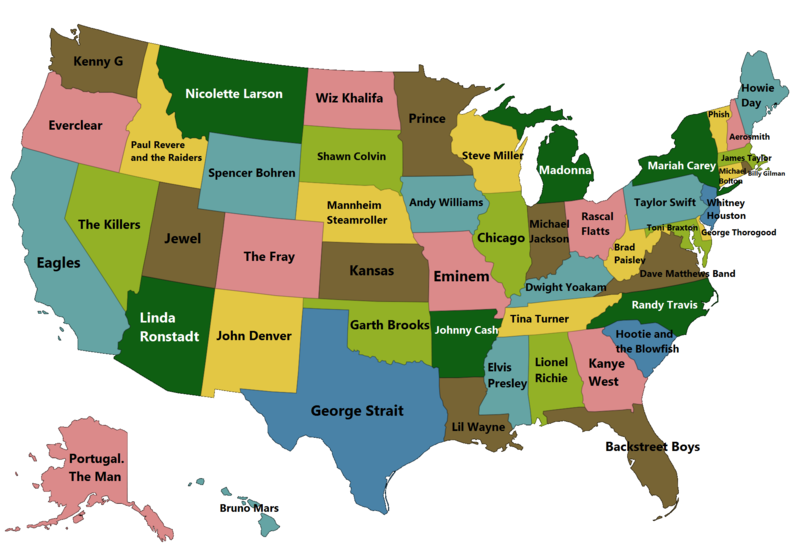 Surely New Jersey should be either Bruce Springsteen or Frank Sinatra?? Both have sold many more than Whitney Houston. Looks a bit off to me. Jewel was born in Utah, but is very much Alaskan. I guess it depends on how you define “from”. Eagles are definitely a California band, though it’s two prolific and majority stake holders are Michigan and Texas born – and raised. I’d be interested in seeing some data behind this, but it is fun to see some of these despite the odd data errors. Aerosmith are from Massachusetts. I dunno where you got NH from.